Just like children and pets like cats and dogs, parrots and other pet birds sometimes exhibit behavior problems that their caretakers find difficult to deal with. While there are a number of ways that birds can misbehave and irritate the people that they live with, there tend to be a few behavior issues that are more widely reported than others. Thankfully, most of these problems have rather simple solutions if owners put forth a little time and effort. Read on to learn about the 5 most common behavior problems in pet birds, what your bird means by exhibiting these behaviors, and what you can do to fix them. 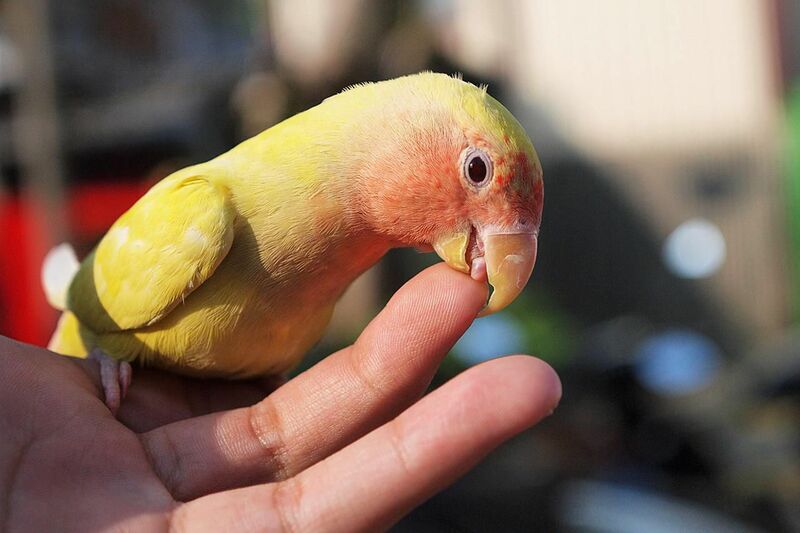 Biting is one of the most commonly reported behavior problems with pet birds, and it's no surprise―bites hurt! Thankfully, it can be easy to correct biting behavior in birds if you can identify the cause. If your bird has been chomping at you, ask yourself a few questions about your pet. Could your bird be frightened of something? Could the biting be hormonal in nature? Is the bird simply trying to play with you? Once you are able to figure out where the behavior stems from, you can take steps to discourage it from popping back up again in the future. Screaming is another undesirable behavior that many bird owners report as a nuisance. While all healthy birds will scream and vocalize at some point throughout the day, problem screaming can be a result of boredom, depression, or some other type of stress that your bird is experiencing. If you've considered all factors and consulted with an avian vet to rule out any medical problems, you may want to talk to a parrot behavior consultant for help with modifying your bird's behavior if the screaming doesn't begin to calm down on its own. Destructive behavior in parrots is often a sign that a bird either has a problem with his or her environment or is not receiving enough vital mental stimulation to keep its mind occupied. Birds are very intelligent and they need lots of attention in order to keep from becoming bored. If your bird is showing signs of blatantly destructive behavior, it may be a good idea to assess how you are spending your time with your pet, and take steps to make your bird more included in your daily activities. Doing so can greatly reduce destructive tendencies in most pet parrots. Often, birds who suddenly become territorial are simply experiencing hormonal problems due to breeding season. However, territoriality can have other triggers and can be a sign that your bird is not as happy and comfortable with you as you might like him to be. To help curb territoriality and related behaviors, try practicing some bonding techniques with your feathered friend. Improving your relationship on a fundamental level can go a long way in terms of resolving behavior problems with your pet. If you find that your bonding practices aren't helping things improve after a reasonable amount of time, consider hiring a parrot behavior consultant for help. Feather plucking can occur in cases where birds are severely depressed and unsettled in their environments. If you notice feather plucking in your pet bird, then you should immediately consult with an avian vet to rule out the possibility of diseases such as PBFD. If it is determined that there isn't a medical cause for your bird's plucking, then it's imperative that you take a long look at the way you are housing, feeding, and interacting with your bird. Keeping your pet in a cage that's too small or dirty, feeding food that lacks nutrients, and not paying enough attention to your bird can all cause your pet to start plucking his or her feathers. Keep your bird healthy and happy by doing all that you can to provide the best care possible. Why Do Pet Birds Regurgitate or Vomit?